A couple of friends and myself are thinking about hiring somebody who could find and negotiate contracts for us. What percentage of each contract amount should we compensate this individual? We're setting up an import / export company. 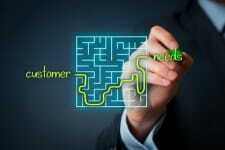 Outsourcing the finding and negotiating of your contracts is akin to outsourcing marketing and sales negotiation. I don't know of any company who successfully outsources these crucial areas. You may do better to seek a business partner or employee with these crucial skills before setting up your company. The risk you would expose yourselves to, should something happen to this pivotal person, would be large. How would you introduce your pro negotiator to the seller or buyer? "Ms Jones, I'd like to introduce our outsourced professional contract negotiator. Good luck and goodbye!" The vendor or purchaser would likely be very guarded, could ask for a break to allow them to fetch their lawyer or senior manager, or they could end your meeting prematurely. Even if introduced as a 'consultant', suspicion will be aroused and you would have to plan answers to the questions that no doubt would follow. In your case, you may wish to offer this person a role in your company. This can be fully time or a non-executive role. We would always recommend that you stay in the room when your outsourced negotiator is batting. Why? You will be paying for and so should take learning's from your negotiation expert. Negotiation is such a key area of competitive advantage, and so directly impacts your bottom line that you cannot afford to not learn to negotiate. So stay in the room, and treat your deal as negotiation school. Discuss your negotiation strategy, processes, tactics, and areas of power with your expert power negotiator before the meeting, and review again with them afterwards. Over time, you should aim to take over negotiating, and keep your negotiator in the background as your support. By keeping a close eye on your expert whilst negotiating, you're able to gauge whether they are worth their fees. With proper preparation, you will be able to add value. You understand your business better than anyone. Yes, much better than your pro negotiator. Your business and industry knowledge should prove invaluable in a negotiation. You can fulfil some very useful roles. Examples include: keeping to agenda and timing, capturing agreements and echoing agreements in the meeting, nurturing the business relationship, watching for certain body language cues, leading the creative brainstorming. There is no better way to gain negotiation experience than by sitting in the hot seat yourself. So if you can handle it, cast your consultant in a supporting role. Prepare thoroughly. If you're selling, then ensure your outsourced negotiation consultant is familiar with your sales negotiation process. If you're on the buying side, then ensure your consultant is briefed on your category management processes. Your consultant negotiator should spend hours or even days of preparation with you to ensure that you get a great deal - or that you walk away from a bad deal. Since most negotiators don't prepare sufficiently, you're likely to be surprised at how much time is required. There is no better method of learning. After the negotiation, be sure to invest time in taking feedback from your negotiation consultant. Of course whilst learning by doing is the best method, it can also be the most expensive method - mistakes at the negotiation table cost money. To minimise on costly mistakes, prepare a mock negotiation where you role play. To get the most value, take it seriously and minimise the coaching during the session. You get the best results by analysing afterwards using a video camera. We prefer using 2 video cameras using split screen technology so that you see both sides of the table simultaneously. Our customised case studies and the video feedback that follows are consistently rated as being amongst the best learning experiences for our best in-house negotiation training seminars. With sufficient quality preparation, you personally should be able to get most of the value from your negotiation. Assisting behind the scene is our preferred method of consulting. Crucial to solid negotiation preparation is starting your negotiation consultation early enough - this usually means long before you think you need to. It takes time for example to gather quality information, get the right people on your side, formulate the best strategies, and create options. Unless you want to get the worst from your professional negotiator, don't parachute them into a deal in the 11th hour. Sadly most clients call for help when things are already going off-piste. We would recommend your reading books and attending negotiation courses in order to improve your own negotiation skill-set, and enable you to not need as much foundation consulting at the negotiation table. We find that our consulting takes on a different dimension with clients who have already attended our foundation negotiation training. We're able to work faster, they understand and integrate lessons more easily, and they're much more confident implementing our advice. 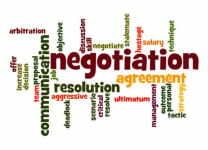 As with any business negotiation, you should have a plan for when to go it alone - before contacting a professional negotiator. We suggest that you share this plan with your consultant negotiator, so that they are in agreement with you and focussed on creating the competency your company needs in your negotiation team. Be realistic by setting competency goals for each negotiator, rather than just pinning your hopes to a target future date. There are many different reward and payment structures to consider. We recommend your reducing the upfront fee and paying a percentage of success. Simply put, having no skin in the game can kill motivation. Be very careful to set and agree your payment criteria, for both parties' interests. For example: your consultant will want to be comfortable that if you back out of the deal, that he or she will not lose out on commission. You will want to be reassured that your consultant is motivated to close the deal at the best margin. We also recommend that you consider paying a bigger percentage of a premium rather than a smaller percentage of the overall deal. For example: If you feel confident of achieving $10 million on your own, but would like to earn or save 10% more, then agree to pay a bigger percentage of the additional $1 million rather than a smaller percentage of the entire $10 million. Of course a combination of the above is also an option worth considering. Consider that estate agents are just as motivated to earn commission on your property selling at $1 million as they are at discounting it to $950k. Why? The estate agent loses only $1'500, whilst you lose $50'000. The estate agent is more concerned about losing their entire commission ($30k) than by losing the $1'500. Ensure that your budget will go the distance of the deal. The more complex the deal, the longer the negotiation will last. If you're paying on a time basis, we advise you to have your negotiation consultant let you know when you are approaching your monthly or quarterly budgeted time. If your deal is likely to stretch into months, or you have multiple deals for consultant to work on, we suggest your paying a retainer rather than paying on a strict time basis. You will likely be able to negotiate a more affordable deal by agreeing time upfront. More importantly, the consultant will reserve time in their diary to ensure that you get the time you need. We would also suggest that you agree working hours and priority of service. Some deals demand short notice and working late into the night. You don't want to be charged hefty overtime rates or worse: going it alone. If they are unavailable, you'll want to know that their company has a suitable replacement who can step in. Most professional indemnity insurance policies don't cover negotiating on a client's behalf. So ask your consultant to check with their insurer, and be sure that they are covered. Checking for insurance cover, especially the type and level of cover should be one of your standard quality checks. 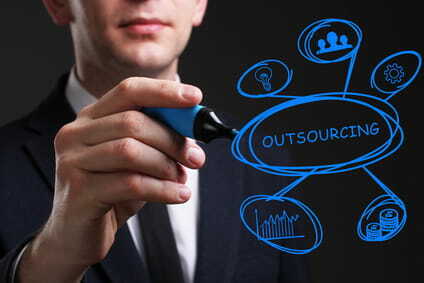 You can choose to outsource your services for Legal, Accounting, IT, and even HR. Think long and hard before you decide to outsource the competency that delivers the biggest impact to your bottom line profit, and therefore your area of greatest competitive advantage: negotiation. Negotiators often don't say everything they're thinking. 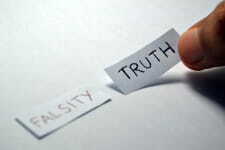 Sometimes they hold back or distort information to avoid being exploited by the other party.